Our series of gardening classes with our Fernhill gardening experts begin on Wednesday April 17th and will take place every fortnight at 4pm. 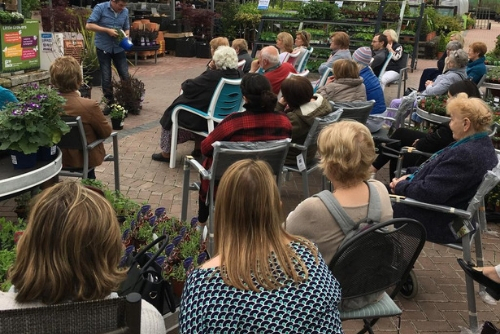 These classes are free of charge and all are welcome as we hope to teach you more about how to get more out of your garden and some useful hints and tips from our expert horticulturists. Classes run from 4pm – 5pm which will include a demonstration and a Q&A session. Join Gary in our outside covered area to learn all about growing vegetables in your garden. With everything from organic farming, the best compost and using farmyard manure to chemical free, no dig gardening, you’ll leave Gary with a wealth of knowledge. He has got great tips to share with you about transplanting and how best to sow as well as making the most of small spaces with container vegetable patches. And for those who love the idea of growing your own but are time poor, Gary will be sharing his tips on low maintenance gardening too. Mary will be talking to you about adding colour and texture to your containers and baskets just in time for the Summer bloom. From the perfect plants for baskets to how to get the most out of your containers, Mary will be giving you great hints and tips on how to create a wonderful haven of colour around the garden this Summer. Join Catherine for this Summer Colour masterclass. Learn all about planting for Summer colour, texture, depth and making the most of your plants, pots and garden during the season. How to best add that splash of everlasting colour to you Garden, choosing the correct plants to suit your soil type and position in your garden. Want your garden to be the envy of all your guests? Eoin will talk about the basic rule of design to help you achieve the best results in your garden layout, be it a new build or just to add that bit of magic to your existing garden. We will be discussing features using plants, ornaments, furniture, paving and other gardening accessories to make the most of your outdoor space, just in time for the Summer season. For more information, please call us on: 090 6475574 or email info@fernhill.ie.